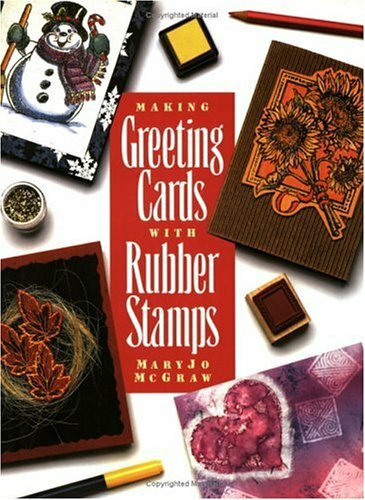 This is one of the better rubber stamping books.If you are interested in a book on making greeting cards using rubber stamping, I highly recommend it. I am just getting started in the hobby of stamping and card making.This book was nice, but I have seen better.Maybe once I start doing more and become an avid card maker/stamper, I will appreciate this one more. I was thrilled with this book.I am a novice at rubber stamping and I wanted to make my own Christmas cards this year, so I bought Ms. McGraw's book hoping it would be what I needed.It is perfect for the beginner (and probably those who know some about stamping but want more ideas and information).The book is laid out in a format that is easy to follow and not overwhelming or confusing.It is written with specifics in mind.It offers plenty of options giving you room to stamp as fancy or as simple as you like.I highly recommend this book to everyone who loves stamps! This is a great book for beginners and has excellent explanations and step by step instructions for the techniques involved. 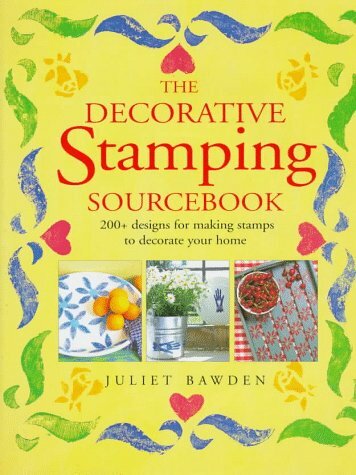 The only thing that stopped me from giving this book 5 stars is that the designs in the book are a little dated looking, and the list at the end of the book of what stamps were used and where to buy them was not nearly complete and explicit enough. 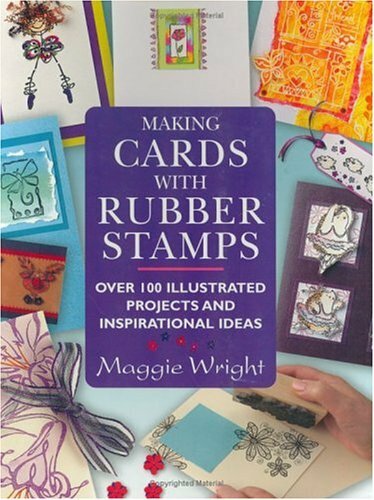 Create bright, bold and exciting greetings cards using rubber stamps and a whole range of inventive and easy-to-do techniques. 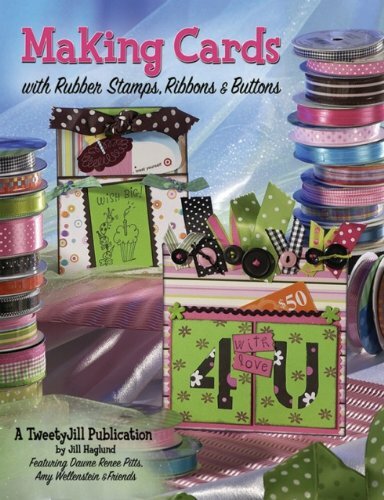 This fun, techniques-led rubber stamping book is the perfect introduction for anyone who wants to create professional looking greeting cards with speed and ease. 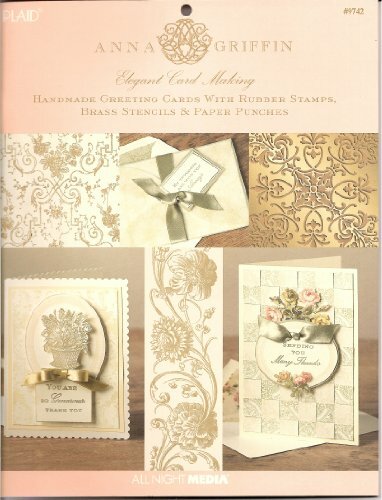 The tools and materials required are illustrated and described, and include brushes, markers, ink pads, wood mounted stamps and all the paper and card available on which to design your greetings. 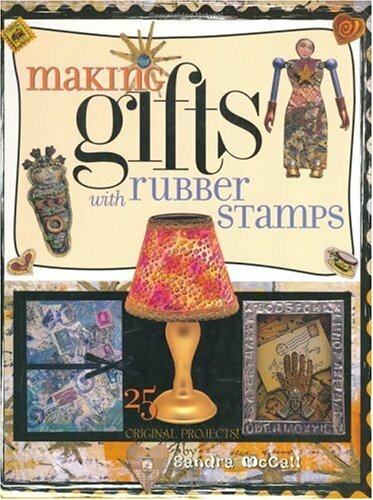 Making Gifts with Rubber Stamps by MaryJo McGraw will bring out your creative and artistic side. Instructions are easy to follow. The many uses of embossing and ink are amazing. She shows you how to take something very simple and turn it into a beautiful work of art. This is a very nice book. I enjoyed the projects and got some good ideas, particarly the simple book and the shadow box which I will definitely be making.For my taste personally there was a bit too much stamping on velvet, material, and jewelry.I would have preferred more paper crafts. But it is "making gifts...". SO I will definitely dig up more books with stamping on paper by Sandra McCall.I also recommend Tim Holtz' An Altered Journey DVD. He makes a cool brayer embossing gift & cool domino book.I love Penny Black stamps, they are my favorite, so I'm always on the lookout for anything using those materials. Sooooo Inspiring! A true artist! 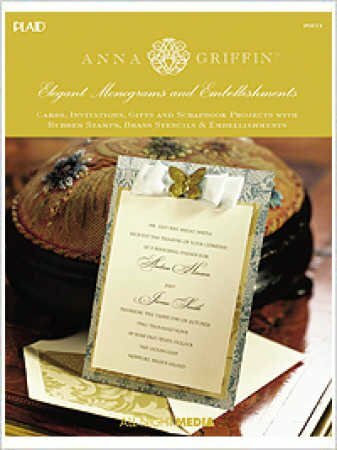 The work of Sandra McCall has long been an inspiration to me, and to finally see it in print, and have such delicious photographs to keep in front of me is a real gift.The instructions are precise and easy to follow!And once again, Ms. McCall lends a new angle to the art and craft of stamping!Bravo! 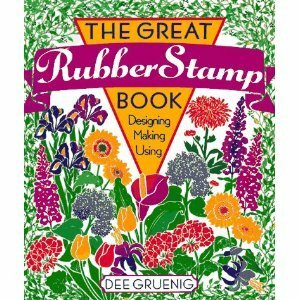 I'll keep this short.If you want to take rubber stamps to the next level and learn to make fabulous objects,buy this book and you won't regret it.It's a DEFINITE keeper!!!! fan of the author Dee Grunig but wish it had more practical instruction. Totally wasted time and money.. I am a beginning stamper but this book didn't teach me anything except that I dislike such bold,eye-popping colors.It actually hurts my eyes and head to look at this book,let alone try and read it.Garish and very harsh.Turned me away from buying anymore of Dee's book's...sorry Dee,I would rather see you on television so that I can actually see how to do the projects. If you like REALLY BOLD colors and patterns then this would be a book for you, but most people will find it much too harsh I think.The book is primarily brayer techniques that seem like they are designs of 2 decades ago (in color and style).There are some good tips to learn from the book, but the design style put me off so much that I found I didn't want to read it much.I'd say keep looking for other stamping books instead of this one. Good for examples and little else. If you want pictures of stamp art this is a good source.If you want a book to teach you technique and expand you're stamping ability, don't waste you're money here. “A remarkably creative and inspiring book for beginning printmakers and crafters....Beyond the usual sections on materials, tools, and techniques, it offers one and two page vignettes on Gauguin, Munch, 19th-century Japanese woodcuts, etc....explores eraser prints, carving linoleum blocks, woodcuts, and making printing blocks out of polymer clay.”—Library Journal. 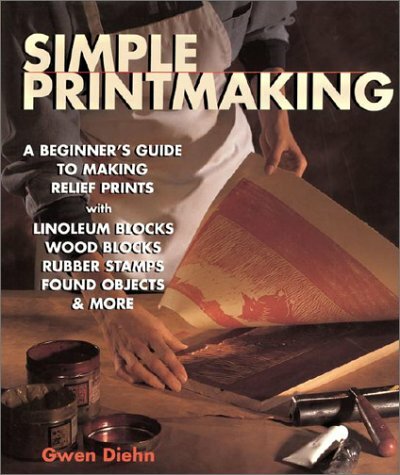 Although the book indicates developing prints from other media than wood blocks, those are very few.Yet the guide to using wood to produce amazing print blocks, with imagery from those made in the past, encourages an artist to use this media.The beautiful projects, tools needed, step-by-step instructions gave the book a 5-star ranking.There is even a project that shows the steps in simple book-making.You won't be disappointed in this book on printmaking/stamping, particularly in the modern frenzy in multi-media artwork. Never took a printmaking class in college...I've been carving erasers and wondering about this new world of relief printing. This book is wonderful. multimedia work...buy this book! Great reference! It'll fill in the blanks for those who have an art education but no basic printmaking. 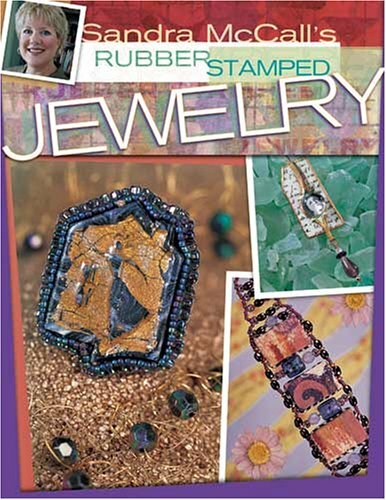 Beautiful, one-of-a-kind projects that are easy-to-make, rubber stamped jewelry appeals not only to rubber stampers and jewelry makers but to crafters of all skill levels. These fabulous jewelry sets are created with simple techniques that lead to beautiful results. In no time at all, readers will learn invaluable techniques to create lovely earrings, necklaces, bracelets and brooches using a wide array of easy-to-find materials like fabric, paper, polymer clay and, of course, rubber stamps. I LOVEthis book!!!!!! !There are so many great ideas. shrink plastic earrings,vinyl tubing to hold beads for c harms,collage pieces, etc.There is a treasure on every page.SO MUCH FUN!!!!!! Ms. Miller has amazing vision into designs of various media and it is great to see her compile some of her work previously published in Belle Amoire and other magazines...plus additional pieces not seen elsewhere.Going over the basics of jewelry construction is VERY basic for the most part (e.g. how to hold open and closed a pair of jewelry plies - with images!) and I feel this was unnecessary for the caliber of the book.Following this are tips on using stamps, polymer clay, shrink art plastic, metal, etc. and put them to use with jewelry designs.These sections are covered well for the beginner and good review for the intermediate to advanced practioners.Almost all steps discussed are complimented with a picture - nice to have.I had to balk at the work done using fibers, primarily as a component for the necklaces (i.e. replacing chain/beads with fibers).For the most part, this style just looked messy to me, although some may find it quite bohemian in appeal.The numerous projects were creative and often inspiring me to go in a new route with my own designs...and this fact is the key for a good book on design of any medium - inspriation/creativity.Some of the pieces/projects were a little much - too many charms, or dangles, and loose fibers - while others were simple, unique and what I would prefer to wear if I had the piece.Therefore - I would consider this book for the beginner to intermediate jewelry artist wanting to explore techniques and products other than just beads/pearls/gems/crystals/wire/chain for their designs.Plus it is great for those of us, me included, to use our abundant rubber stamp collections for implementation using various media (e.g. paper, shrink plastic, polymer clay, dominos, metal - my favorite) into our jewelry designs.I often forget this and by having this book near my work space where I make my jewelry, it is a great reminder when my creative process needs a boost. I bought this as a book to get me started with some basics. 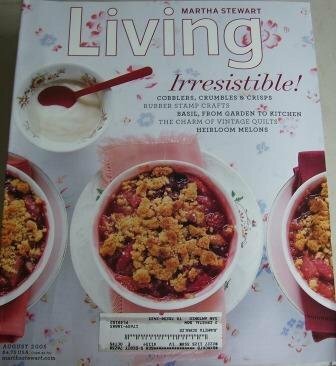 The first section is very detailed on basics other than stamping - some of which came in handy and I used immediately.I like the projects - although some are a little intimidating - such as the polymer clay projects - as I've never used that medium before. A little on the advanced side. I am not a rubber stamper but I used to own a lot of them. Now that I have read this book, I really wish that I had held on to them! I am inspired by the author's use of a craft tool in a totally unexpected way. 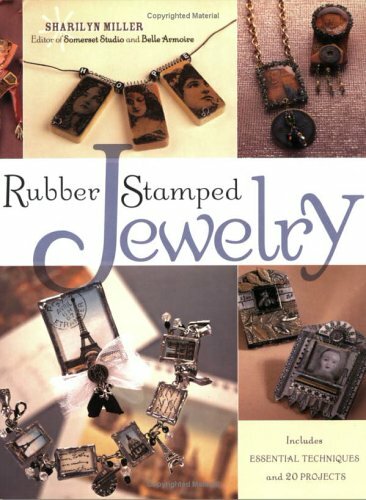 It makes me want to rush out and get new rubber stamps and try them to make some great looking one of a kind jewelry! Sharilyn Miller is a highly respected jewelry designer, and her books are always filled with great how-tos and super pictures. Who knew that rubber stamps could be so cool?